Also serving communities of Dunbar. There are 10 Assisted Living Facilities in the Charleston area, with 7 in Charleston and 3 nearby. The average cost of assisted living in Charleston is $4,295 per month. This is higher than the national median of $3,346. Cheaper nearby regions include Scott Depot with an average starting cost of $3,995. To help you with your search, browse the 31 reviews below for assisted living facilities in Charleston. On average, consumers rate assisted living in Charleston 3.9 out of 5 stars. Better rated regions include Scott Depot with an average rating of 5.0 out of 5 stars. Caring.com has helped thousands of families find high-quality senior care. To speak with one of our Family Advisors about assisted living options and costs in Charleston, call (855) 863-8283. The city of Charleston is the capital of West Virginia and also the most populous city in the state with 49,736 residents. Residents aged 55 and older make up about 32 percent of this vast city, raising the median age in town to 41 to 43 years old when compared to the national median age of 37.9. Charleston accommodates senior residents with seven local assisted living facilities for seniors to choose from. There are eight more nearby as well. These facilities can be licensed in one of two ways: assisted living residence or residential care community. The Department of Health and Human Resources (DHHR), Office of Health Facilities Licensure and Certification (OHFLAC) monitors and regulates each community to ensure seniors receive proper care. Seniors living in Charleston have a lower cost of living that ranks an 84 compared to the 100-point national average. These lower expenses benefit elderly residents on a low-income budget, where most can save significantly on grocery, transportation, goods and services, housing and health care costs. Seniors looking to move to Charleston should consider the high crime rates that rank the city as the 19th most dangerous city in the nation. Both violent and property crime rates are much higher than average, which may concern some seniors and their loved ones. Local seniors experience fewer issues with their respiratory illnesses in Charleston, where the air quality is considered 31 percent better than the national average. This experience is similar for severe allergy sufferers who can enjoy an 81 percent better pollution index when compared to cities nationwide. Moderate summer temperatures average between 56 degrees Fahrenheit to 85 degrees Fahrenheit, making it easier for seniors to spend time enjoying the great outdoors. However, winter temperatures average between 27 degrees Fahrenheit to 52 degrees, which might make it difficult for seniors with conditions that are agitated by cold weather. Locals in Charleston have access to transportation through the Kanawha Valley Regional Transportation Authority (KRT). Fares for seniors riding the KRT are discounted with a valid half-fare card or Medicare Card. 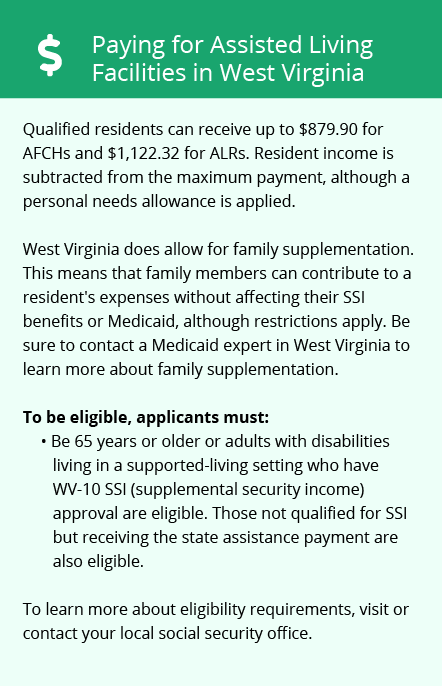 Charleston has an array of community resources for seniors, including Kanawha Valley Senior Services, an organization that assists seniors with Medicaid plan assistance, transportation services, nutrition and recreation programs. Assisted Living costs in Charleston start around $4,295 per month on average, while the nationwide average cost of assisted living is $4,000 per month, according to the latest figures from Genworth’s Cost of Care Survey. It’s important to note that assisted living rates in Charleston and the surrounding suburbs can vary widely based on factors such as location, the level of care needed, apartment size and the types of amenities offered at each community. Charleston does not cover assisted living under Medicaid, but eligible seniors could qualify for special needs circumstances and the supplemental security income (SSI) program. Charleston West and the surrounding area are home to numerous government agencies and non-profit organizations offering help for seniors searching for or currently residing in an assisted living community. These organizations can also provide assistance in a number of other eldercare services such as geriatric care management, elder law advice, estate planning, finding home care and health and wellness programs. To see a list of free assisted living resources in Charleston West, please visit our Assisted Living in West Virginia page. 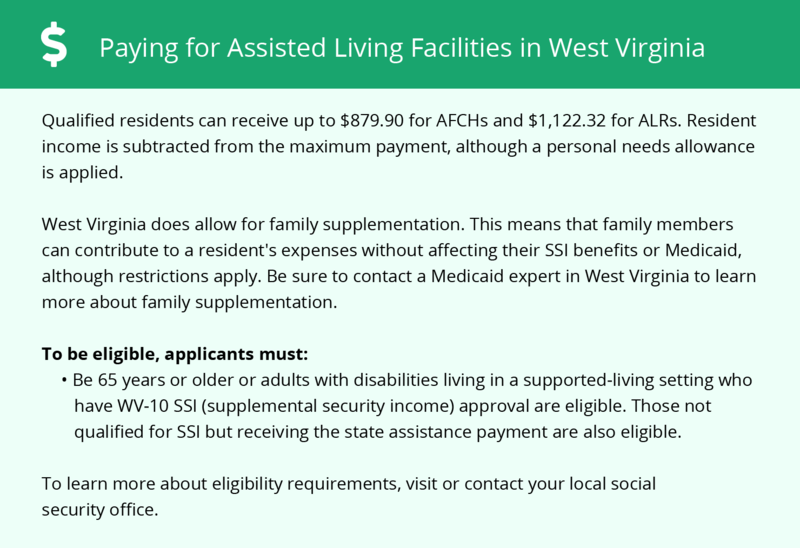 Charleston West-area assisted living communities must adhere to the comprehensive set of state laws and regulations that all assisted living communities in West Virginia are required to follow. Visit our Assisted Living in West Virginia page for more information about these laws.